In an era of ubiquitous digital devices, can an analog board game teach a preschooler to program? 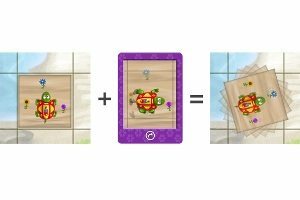 It can certainly get them started in the right direction, says Dan Shapiro, the Seattle serial entrepreneur and father of twin four-and-three-quarters-year-olds, who spent the summer making a game called Robot Turtles. He launched a Kickstarter campaign today that quickly surpassed its goal to back a modest initial production run of the game by DeLano Services, a manufacturer in Battle Creek, MI. Shapiro, 38, was looking for something fun and challenging to do with his kids, while also introducing them to the basic principles of programming. He found that most efforts are geared for kids age 8 and older—the Scratch project at MIT, for example. It requires a computer and the ability to read. With Robot Turtles, Shapiro—on a leave of absence from Google, which acquired his most recent startup in 2011—is taking the push for computer science education to the earliest levels. The game is designed to teach things like logic, thinking ahead, spatial orientation, and debugging. The game play scales from the simplest sequencing of directional commands that will occupy a 3-year-old, to the creation of intricate mazes and efficient solutions to move the turtles through them—complete with subroutines called Function Frog—that can challenge older kids on the cusp of actual programming and entertain adults, he says. Shapiro delights in watching kids play the game, while seeing them learn to build and refactor programs, to undo and debug code. And the kids love to boss around the adults who actually move the turtles through the maze according to the kids’ instructions, he says. “For them, it’s just a game, but when they see these concepts again and actually start using a computer, this is going to be second nature,” he says. Shapiro was introduced to programming at age 7. His mom, a professor of speech and communications, won an argument with his computer science professor dad about whether young Dan should have a Commodore 64. His first program? A game based on the musical Joseph and the Amazing Technicolor Dreamcoat. That led to summer computer camp where Shapiro learned the Logo programming language, famous for its “turtle graphics” to which Robot Turtles pays homage. Shapiro says he was terrible at drawing, but was proud of the images he could create with the computer. It was, he says, his first “superpower” and remains the greatest skill he can pass on to his kids, regardless of what they do in life. “I don’t know how technology will unfold in the next six decades, but people who can program are going to be writing the future and everybody else is going to be reading it,” he says. It looks like plenty of people are. By mid afternoon, the campaign had blown past its $25,000 goal with contributions from more than 500 people. But this doesn’t mark the beginning of Shapiro’s Milton Bradley period. “I have no desire to be a board game entrepreneur or run a board game company,” he says. So will he be returning to Google in Kirkland, where he was on the Google Ads team and CEO of Google Comparison, the wholly owned subsidiary that resulted from the search giant’s 2011 acquisition of Shapiro’s consumer electronics shopping startup Sparkbuy? Shapiro couldn’t confirm that, saying he is not authorized to discuss anything about Google.